Sideshow is proud to introduce Gotham’s own caped crusader Batman as the next addition to Sideshow’s line of Legendary Scale™ Figures. 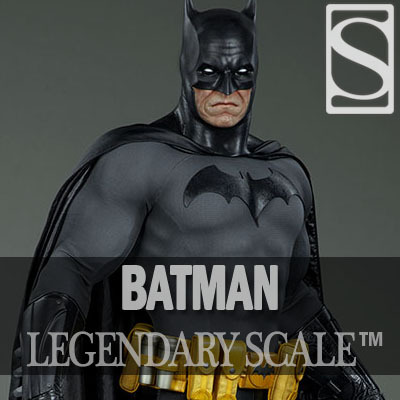 Based on his comic book appearance, the Batman Legendary Scale Figure has a grey and black costume adorned with a yellow utility belt and his ever-present bat insignia on the chest. The solitary crime fighter is clad in a fabric cape, standing in a powerful pose as he emerges from the shadows to confront evil in his city. Sideshow’s take on this iconic hero is crafted out of polyresin, fiberglass, and fabric. As a part of our Legendary Scale™ lineup, this half-scale depiction of the Dark Knight himself stands an impressive 43” tall and is 23” wide at the base.